With a dozen best-selling cookbooks tucked under his belt, Jeff Smith, is best known for hosting the popular American cooking show that began in Washington. The show was aired in PBS from 1988 to 1997. Smith was a United Methodist who graduated at the University of Puget Sound in 1962 and Drew University in 1965. His first run at food ventures was the Chaplain’s Pantry where he held cooking classes to the public and stored deli and kitchen supplies as well. Being in the celebrity status that he is in the world of cooking, Smith has had his share of controversies as well. Legal issues concerning sexual harassment in the 70s were just some of the trials that Smith had to go through. 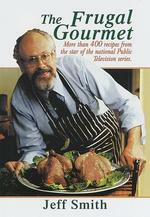 Known to be the food genius that he is, Smith has authored several books under his wing including The Frugal Gourmet (1984), The Frugal Gourmet Cooks with Wine (1986), The Frugal Gourmet Cooks American (1987) and The Frugal Gourmet Cooks Three Ancient Cuisines: China, Greece, and Rome (1989).